The Neve Harms Award for meritorious service to the youth of central Illinois is awarded this year to Dan Shea, who is the 44th recipient of this award. Dan has been active in numerous volunteer sports, church and community events for 50 years. These activities consist of coaching and officiating in intermurals at Holy Family grade school, with both boys and girls softball team. Dan volunteered on many evenings and weekends. He was on the board and co-director for years in the annual March of Dimes Snowball Softball Games as well as the March of Dimes One Mile Mall Run. He was a 10 year member of the Illinois Valley Striders board and was in charge of the Steamboat 4 mile course for 10 years. Dan, 73, is on the Peoria Mayor's Commission for the disabled. He is also on the Holy Family Mexican mission committee. He has helped veterans clean up Soldiers Hill in Springdale Cemetery, and has helped Santa at the Journal Star Red Stocking Fund party for 28 years. Dan still helps as a monitor for the Steamboat Classic, the Brimfield Run, the Jack Kenny Gaelic Gallop, the OSF Wildlife Park Race, the Race for the Cure, and the Mike McGlaughlin Run in Bradley Park. Despite a 6-bypass heart surgery and diabetes that limited his walking to a cane and a 3-wheel walker, Dan still helps coach Ed McGraw with his girls track and cross-country teams at East Peoria High School. Despite all his activities, he found time to bowl in two leagues and played in two softball leagues. He also coached Jimmy's Bar girls softball team for eight years in the 1980's and 1990's. Besides volunteering for many other activities, he ran for 20 years between ages 45-65 and competed in 336 races from New Hampshire to Hawaii and Florida to California. He also completed seven marathons and 10 triathlons. He continues to volunteer at Holy Family School as well as at the Knights of Columbus. 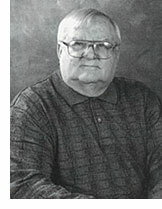 Dan wrote sports for the Peoria Journal Star for 10 years in the 1950's. He served with the U.S. Army during the Korean War and retired from the Journal Star in 1992 after 41 years, the last 26 years as Day News Editor.